IXXAT offers the new FR-IB100/PCIe, an extremely cost-effective and high-performance interface card for FlexRay analysis and control applications. The interface card is also suitable for the analysis of FlexRay start-up behaviour (asynchronous analysis mode). The FR-IB100/PCIe interface card is ideal for use in desktop PCs at laboratory workstations as well as in industrial computer systems such as test benches. The compact design of the interface cards allows installation in low profile cases. 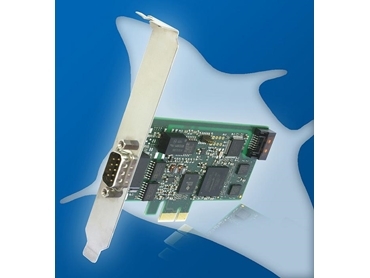 The interface card comes with an on-board 32-bit micro-controller system and two FlexRay channels (2 x 10 MBit) with Freescale MFR4310 protocol chip in addition to providing a time stamp resolution of 100 ns. Customer-specific applications can be programmed with the supplied drivers for Windows XP, Vista and Windows 7 (each 32/64 bit) using C++ or .NET. Example applications in C++ and C # enable an easy and fast start. Additionally, IXXAT offers the multibus analyser, a powerful tool for analysis of FlexRay devices and systems. A FlexRay configuration tool for users upgrading from CAN to FlexRay is included in the scope of delivery enabling an easy control of the large number of FlexRay communication parameters. After entering a few parameters such as cycle time, number of messages and length, the tool automatically calculates the dependent parameters and creates a file to configure the FlexRay protocol chips. Due to the good price-performance ratio, the FR-IB100/PCIe is suitable for production use and best suited for the analysis of FlexRay systems with comprehensive software support. IXXAT Automation is a leading provider of data communication products and services for the automation and automotive industries. IXXAT products are available in Australia from Can + Automotion .